“World’s Best Dad” was completed in mid-April, 2010. The stone is Mongolian Imperial Black Marble, the same stone I used for the platypus, “Nature’s Paradox.” Once again, this stone was a pleasure to carve. Perhaps the only downside to carving it is the smell of swamp gas released whenever you cut into or scrape the stone. Small price to pay for such a versatile and opulent conclusion. The stone is finished to three separate degrees: raw stone for the chick, spots, and incised lines; 1500 grit polish for the adult; and 10,000 grit polish for the water. This sculpture is a tribute to my Dad and to great Dads everywhere. 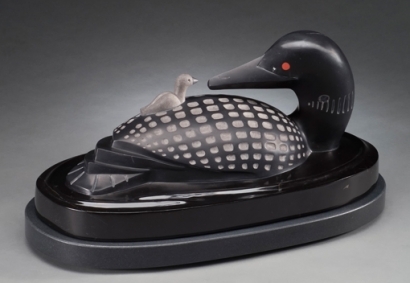 My Dad would be pleased to be honored with the image of a loon. He loved the lake and he loved to swim. He also loved a good laugh. Loons pair for life and are attentive parents. As part of my research for this sculpture, I read an account of two biologists who did a study on a Minnesota lake. They were interested to determine the strength of the bond between adult loons and their chicks. They maneuvered their small boat between the parent and chick, thus separating them temporarily, and took notes on how much the parents and chicks were freaking out. The biologists performed this experiment repeatedly on as many loon families as they could find on this one lake. I can’t help but imagine the population of traumatized loons they left in their wake.